The increased drilling activities due to the development of unconventional hydrocarbon resources and the adoption of automation and robotics in oil and gas drilling, which results in higher efficiency drilling and improved safety in rigs will drive robotic drilling industry in the coming year. 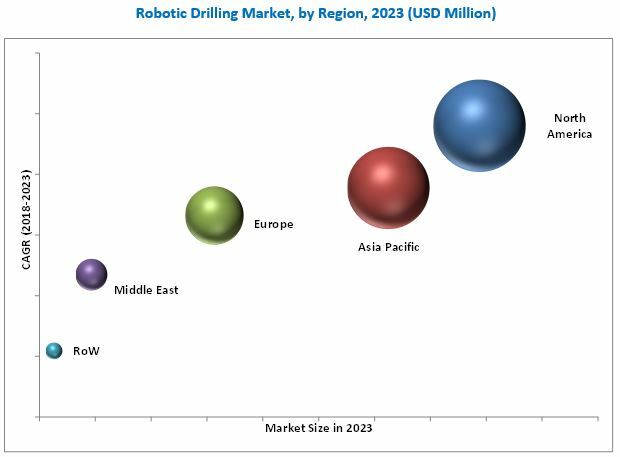 The global robotic drilling market was valued at USD 615.3 Million in 2017 and is expected to grow at a CAGR of 7.01% during the forecast period, to reach USD 923.2 Million by 2023. North America is estimated to grow at the fastest rate from 2018 to 2023, followed by the Asia Pacific. The US, which is the largest shale gas producer in the world, is expected to continue to dominate the robotic drilling market in North America, by witnessing the highest CAGR in this market. The Asia Pacific is the second-largest segment in which China was the largest contributor the Asia Pacific robotic drilling market in 2017; the countries in the Asia Pacific are continuously developing their oil and gas resources to meet their domestic production demand. The application is classified into into onshore and offshore. The onshore segment accounted for a larger market for robotic drilling, based on application, in 2017. Globally ~70% of the oil and gas production takes place at onshore oil and gas fields. These fields require less capital investment in comparison with offshore fields and the costs related to automation in these fields are relatively low. Formations in onshore wells are more stable during the drilling process than those in offshore; therefore, the adoption of automation in such areas is faster for improving the drilling efficiency. The market for onshore robotic drilling systems is expected to grow at a significant rate in the coming years. The US and China with vast onshore reserves present ample opportunities for the providers of onshore robotic drilling systems. The installation is classified into new builds and retrofit. The retrofit segment is expected to be the fastest-growing market due to the rising requirement to improve safety and efficiency of existing rigs and increasing focus on less human intervention during the drilling process. Nabors (US), Precision (Canada), Weatherford (Switzerland), Huisman (Netherlands), and National Oilwell Varco (US).